Network Rail began their clean up of a high profile station in the Yorkshire Dales today. 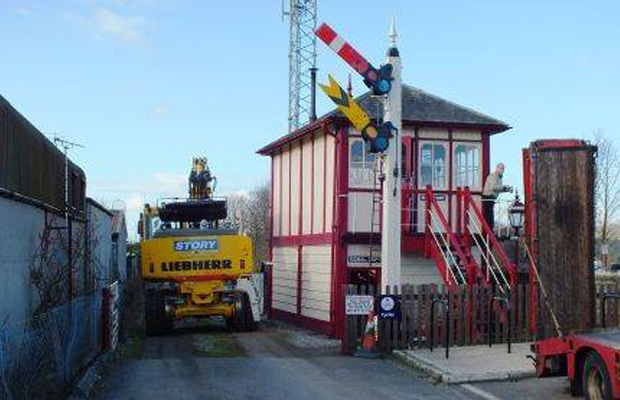 Settle Station is visited by thousands of visitors every year and to improve the look of the surrounding area Story Contracting assisted Network Rail in the removal of scrap rail and redundant sleepers. Story Contracting’s Plant department provided a Road Rail Vehicle (RRV) and two wagons to work alongside Network Rail’s wagon in order to clear a large area adjacent to the signal box. There was a perfect contrast of old and new as the 26T RRV sat alongside the restored signal box, attracting quite a crowd of onlookers who were not used to such a new machine in a heritage site.